CRAPTASTIC: We Have A Winner!! Katie @ The Sweet Paper House! Congratulations Katie! E-mail me (kharris08@gmail.com) with your address so I can send you your giftcard! 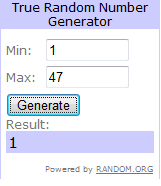 If I don't hear from you in 48 hours I'll draw another winner! Thanks again everyone! Hope you all have a great weekend! Are you serious? Comment 1 won!? Crazy!